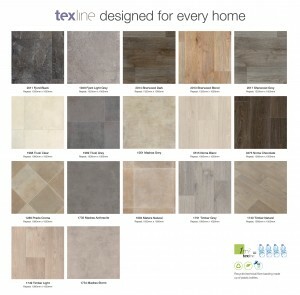 Developed for residential housing, Gerflor’s Texline range of luxury, R10 slip resistant, loose-lay sheet vinyl flooring has been totally refreshed with brand new designs that epitomise the latest decorative styles in wood, mineral, slate and stone effects with superior, realistic finishes and fashion-led colours adding the final touch. The 2018 Texline collection may be better looking than ever, but as it is manufactured using cutting-edge technology to the same very high specification, it can be relied upon to deliver outstanding performance beyond that of standard vinyl. It also embodies Gerflor’s philosophy to continually renew its collections with stunning new looks to reflect world-wide trends in decoration. 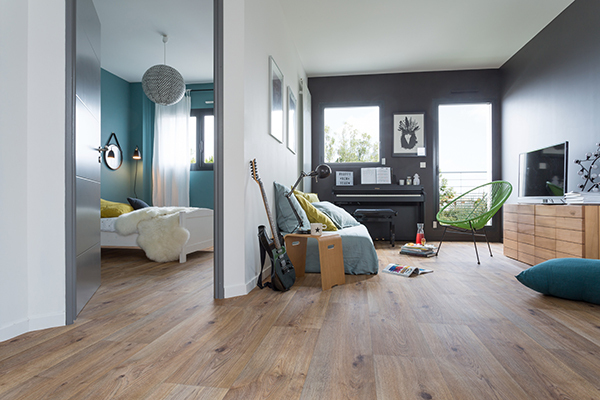 As a mainstay of Gerflor’s housing collection, versatile Texline is suitable for residential new build and refurbishment housing, especially where looks, safety, durability, ease-of-maintenance and low-cost, fast-track fitting are required. At 2.9mm thick, it is also luxuriously cushioned for comfort with extra thermal efficiency and acoustic values of 16dB. For the social housing sector, it is packed with designs, colours and features with tenant appeal. It is, however, Texline’s patented, Gerflor Fibre Technology (GFT) backing that provides added warmth, comfort, acoustic insulation and resistance to indentation. In fact, Gerflor developed the first textile-backed sheet vinyl flooring and includes 95% recycled fibres in its GFT backing system, further enhancing an already 100% recyclable, eco-responsible flooring. In addition, Texline benefits from a tough, compact, waterproof interlayer that resists stretching and warping. The clever and unique duo of fibre backing and stabilising interlayer allows up to 35 m2 of Texline to be loose-laid with minimal subfloor preparation over most existing smooth floorings and directly over concrete without the application of screed or ply to the floor. Texline will automatically remain flat and smooth over small defects beneath to provide a flawless finish to the finished floor. Plus, without glue, installation is VOC free and glue degradation will not shorten the life of the product. Texline’s unique composition also addresses many of the issues that housing professionals face like lowering new-build, post-installation remedial work commonly caused when traditionally-adhered floorings lift, bubble and curl. Waterproof from above and below and 90% RH resistant, Texline is also a problem solver when installing flooring in damp conditions, for example, over new concrete subfloors that are not yet fully dry and within older properties without damp proof membranes (DPM’s). Additionally, adhesive-free, quick-fitting Texline causes less inconvenience to incumbent tenants when a flooring is renewed and can also be easily taken up for refurbishment and simply re-fitted if in good condition. Available with a 15 year warranty and in economical two, three and four metre widths, Texline retains its good looks for longer with ease due to its 0.30mm stain resistant, hygienic and easy-to-clean, in-built PureClean™ surface treatment, which takes considerable wear and tear and doesn’t trap dirt. Housing professionals can also be reassured by the product’s eco-credentials as it is manufactured to Gerflor’s life cycle analysis policy at ISO 14001 certified production sites to the highest international standards for less environmental impact. What’s more, Texline’s low VOC emissions also contribute positively to improved indoor air quality.